Phoenix USA, Inc. began as Cherokee Furniture Manufacturing Company in 1960 and operated for nearly a quarter century in the quiet country setting of Cookeville, Tennessee. Cherokee Furniture operated a fleet of 15 trailers and eight power rig units and equipped them with "hot-forged" aluminum wheels that were bought direct from Alcoa. This relationship with Alcoa, along with a strong interest and valuable experience in the transportation industry, led to the creation of Phoenix USA. Cherokee Furniture closes in 1984 after a devastating fire completely destroys the facility. Although tragic, often an ending is opportunity for a new beginning. Rising from the ashes...a new company is introduced... Phoenix USA, Inc.
Phoenix USA, Inc. appropriately named referencing the legendary bird that arose from the flames to live again. The phoenix bird symbolizes immortality, resurrection and life after death. According to the Greeks, the bird lives in Arabia, near a cool well. Every morning at dawn, the sun god would stop his chariot to listen to the bird sing a beautiful song while it bathed in the well. Only one phoenix exists at a time. When the bird felt its death was near, every 500 years, it would build a nest of aromatic wood and set it on fire. The bird then was consumed by the flames, Next, a new phoenix sprang forth from the ashes to live yet another period. 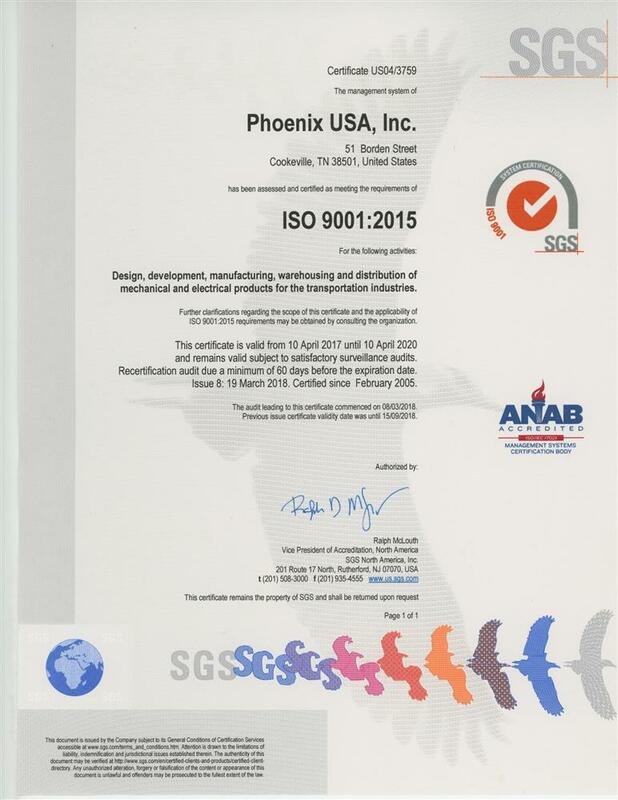 Phoenix USA, Inc. is committed to providing our customers with industry leading quality, outstanding service and an ongoing program to continuously improve through our ISO 9001, ISO 14000 and Q1 certifications. Phoenix USA, Inc. offers the most extensive line of wheel accessories on the planet. We have made a commitment and our commitment is this...to provide only the highest quality products, backed by service second to none, and at a fair price. Phoenix USA, Inc. and its team members are committed to a leadership position in the marketplace and are determined to provide applications for 99% of all trucks and trailers on the road. Over the past 20 years Phoenix USA, Inc. has grown with the city of Cookeville and provides a stable work environment for its employees. The Cookeville facility includes sales, marketing, engineering, product development, accounting, human resources, warehousing and distribution for all of North America.